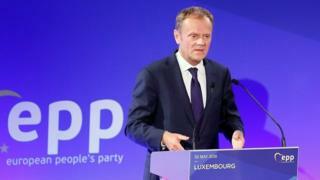 European Council president Donald Tusk has warned that a UK vote to leave the EU could threaten "Western political civilisation". "As a historian I fear Brexit could be the beginning of the destruction of not only the EU but also Western political civilisation in its entirety," he told the German newspaper Bild. UKIP MP Douglas Carswell said the Remain campaign was "falling apart". He tweeted: "Why hasn't Western civilisation come to an end already seeing as how most countries are self governing?" The UK votes on whether to remain in the EU or leave on 23 June. "Every family knows that a divorce is traumatic for everyone," he said. "Everyone in the EU, but especially the Brits themselves, would lose out economically." In the interview he also said Turkey would not become a member of the European Union "in its current state". Employment Minister Priti Patel said: "This is extraordinary language from the EU president, and serves only to reveal his own desperation. "The only thing that is destroying civilisations is the euro, which has ruined economies and led to youth unemployment soaring to nearly 50% in southern Europe." David Cameron's spokeswoman said the PM was "focused on the issue that is on the ballot paper", adding: "We will leave Donald Tusk to speak for himself. "The prime minister has set out many times how he views the opportunities and risks for the United Kingdom."